Full gallery can be found as usual on the Facebook page. It may have only been a 2 out of 6 point weekend, but finally the team from October has shown up! But it took hitting rock bottom to get there. A busy weekend began Friday night on home ice, as the Devils hosted the Penguins for the second time in a month. Keith Kinkaid drew his first start since November 2nd and his first game action since relieving Cory Schneider in Detroit on November 7th. And the rust showed a little early in the first period, as Dominik Uher (after a video review) and Scott Wilson scored 18 seconds apart for a quick 2-0 lead. It didn’t get any better in the second, as Josh Archibald scored just 55 seconds into the second period to up the lead to 3. Brian Dumoulin would add to the rout less than 2 minutes later to make it 4-0. That would signal the end of Kinkaid’s night between the pipes, as Scott Wedgewood would take over from there. He went a perfect 7 for 7, but the Devils could not produce any offensive chances to get on the board, only managing 3 shots for the entire period. Jayson Megna would make it a 5-0 lead early in the third, adding to the insult. Joe Whitney managed to break up Jeff Zatkoff’s shutout bid by scoring his 5th with 13 minutes to go. The rest of the game was spent getting frustrated, chippy, physical…however you want to describe it. Two fights and a 10 car pileup by the Pens bench over a span of 10 minutes resulted in four 10 minute misconducts, 2 on each side. And no real offensive threat from the home team, resulting in their second straight loss. Kinkaid stopped just 7 of 11 shots in 22:36, while Wedgewood finished with 11 saves on 12 shots. Albany just managed 15 shots on goal, a season low. 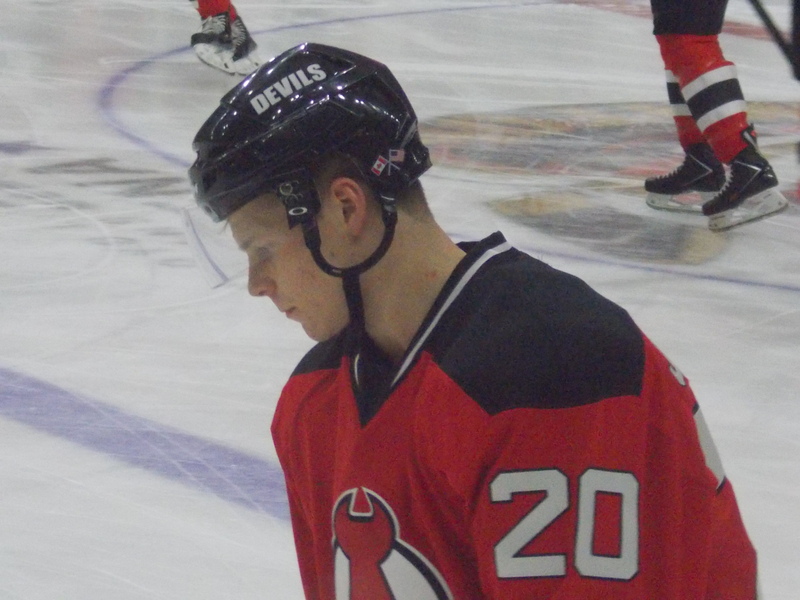 Reece Scarlett was the only other Devil to register a point with the lone assist on Whitney’s goal. It was due west to the Southern Tier on Saturday night for the first of just four matchups of the season against the Senators, who were coming off a penalty filled win in overtime against Manchester the night before. Scott Wedgewood drew the start and…he may have wished he hadn’t. Much like the night before, Binghamton got a quick 2-0 lead in the first via goals from Derek Grant and Garrett Thompson just 56 seconds apart. 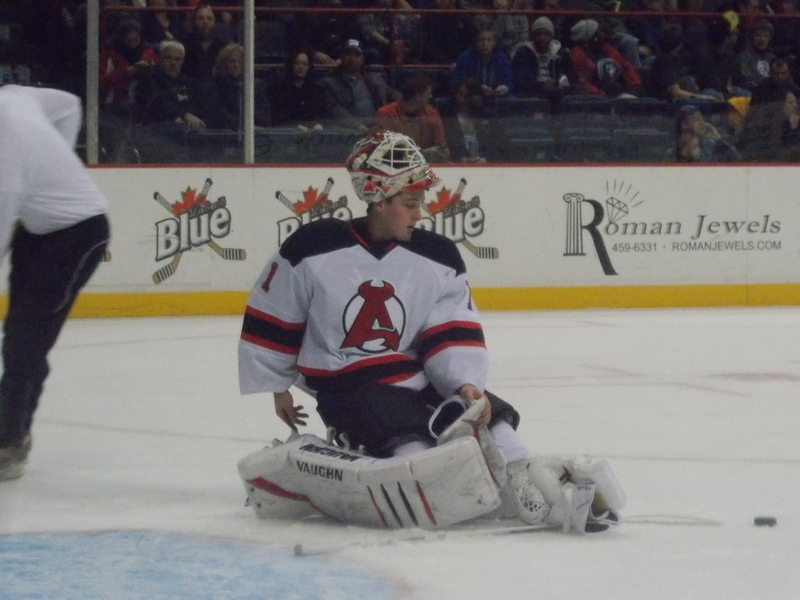 Things would go from bad to worse in the second period…while Albany could not get any offense going against Senators goaltender Andrew Hammond, the B-Sens poured it on. Patrick Mullen scored on the first Devil penalty kill of the game for a 3-0 lead. Chris Wideman would add his 10th goal halfway through the period for a 4-0 lead. Carter Camper would finish the period off with the 5th goal, chasing Wedgewood out of the net after two periods and seeing Keith Kinkaid in a familiar situation…relieving the starter going into the third. And the bleeding continued despite the switch. Grant would score his second of the night to make it 6. And finally, the extra point by J.G. Pageau with 56 seconds remaining would finish off the most lopsided loss of the season, and in franchise history going back to the Lowell days. 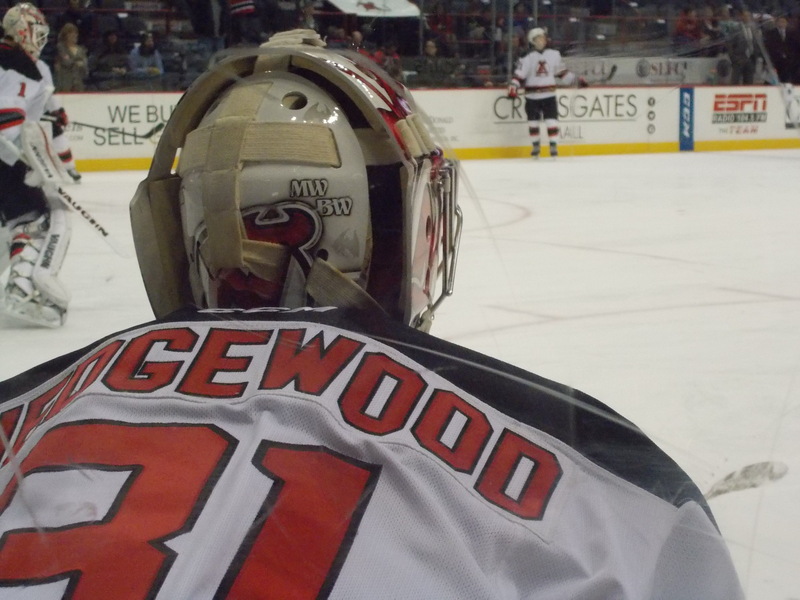 Wedgewood finished with 19 saves on 24 shots, and Kinkaid had 8 saves on 10 shots in relief. In trying really, really, really hard to find ANYTHING good about this game…a season low 6 penalty minutes. And double the shots from the night before, 31. But if you really want to point fingers at what made this happen, look no further than the boxscore…when you have one of your better defensive players in Raman Hrabarenka finish at a -5, you know it was bad. 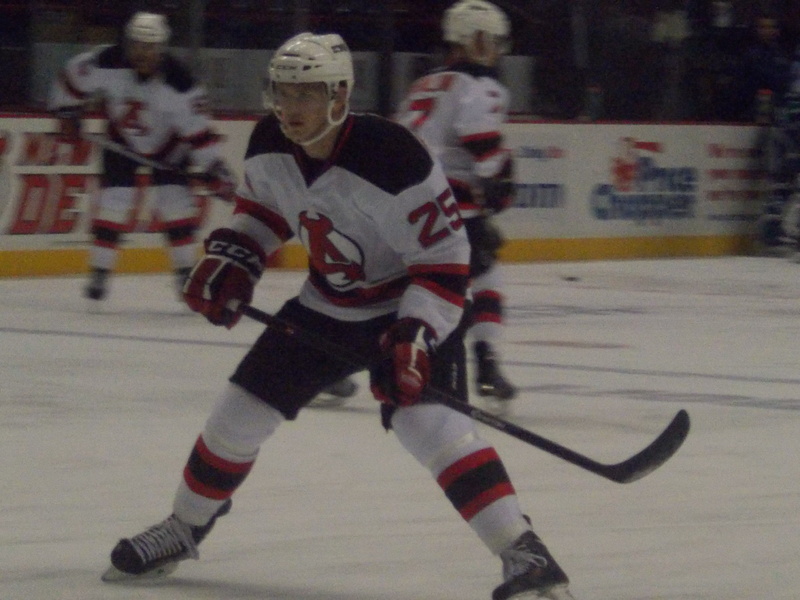 Sunday: With Dan Kelly and Reece Scarlett both getting hurt in Saturday’s loss and one more game left for Fraser to serve, the Devils called on a sort of familiar name to fill the defensive void, bringing in defenseman Eric Baier on a PTO. 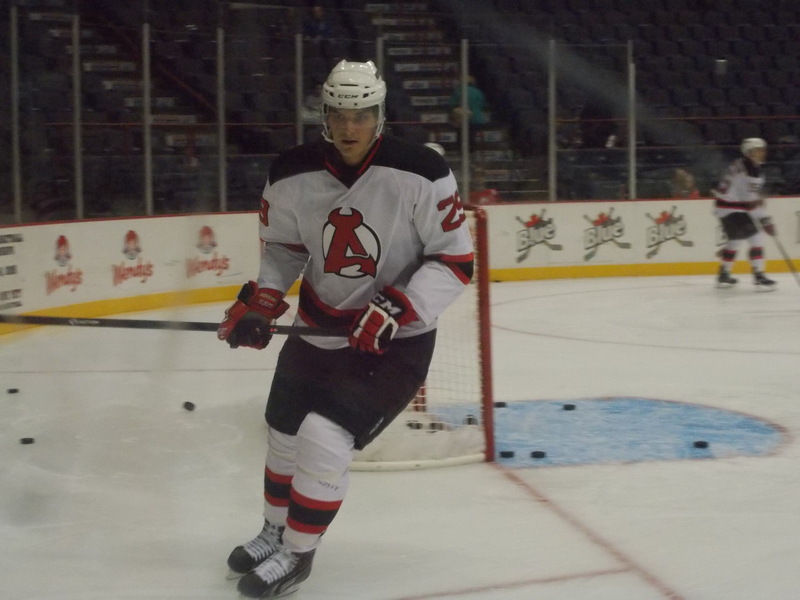 He had appeared in 13 games for Albany during the 2011-12 season. In 16 games with Orlando so far this season, he has 8 points (4 G, 4 A) and a +9 rating while serving as the team captain. One last home game to close out the weekend, and it was a familiar foe…for the sixth time on the season and the third time on home ice, it was the Sound Tigers coming in for a visit. The good news was the return of Paul Thompson to the lineup after he served his two game suspension. 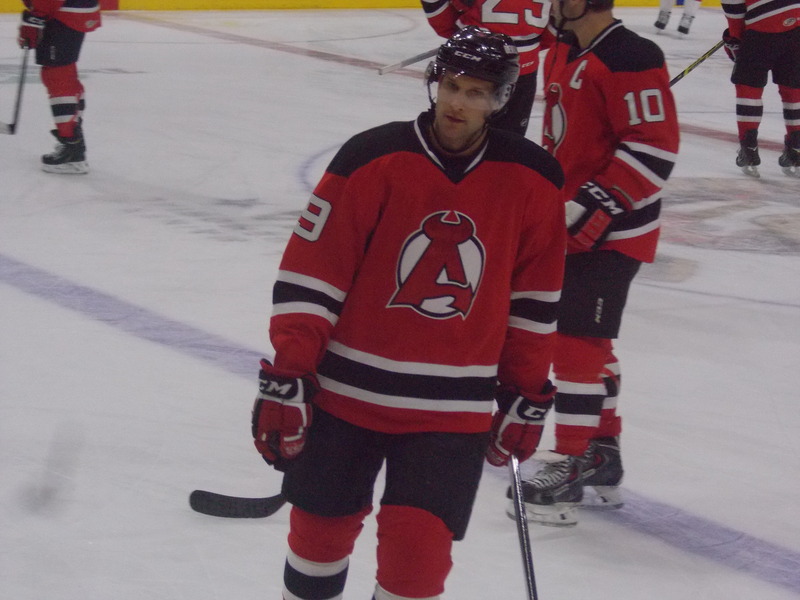 But Scott Timmins, along with Kelly and Scarlett, were out, making for a 13 forward/5 defenseman lineup taking the ice. I’m not sure what happened after the previous night in Binghamton, whether it was in the locker room or on the bus ride home, but the team that came out Sunday was the one I’ve been looking for the past three weeks. 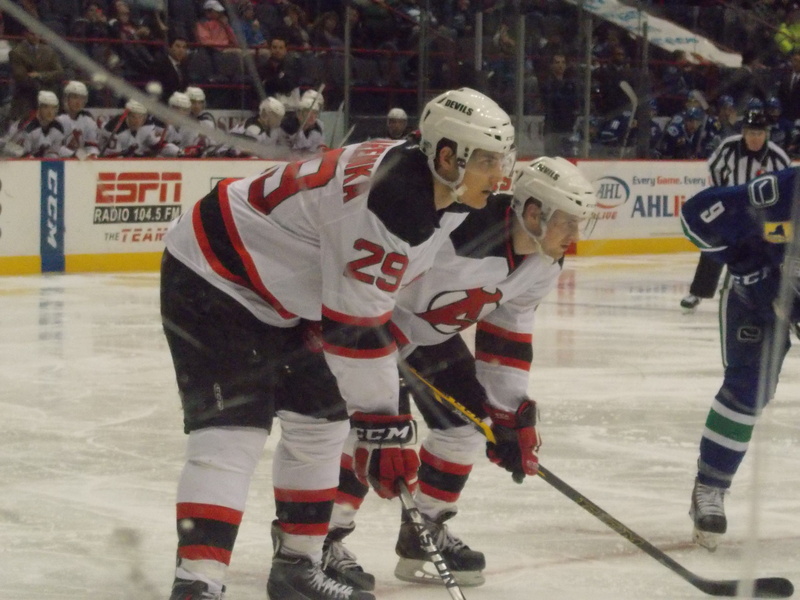 Thompson made his lineup return a successful one, scoring on a power play midway through the first period for a 1-0 Devil lead, the first since the 14th. Johan Sundstrom would tie the game up just before the first ended. 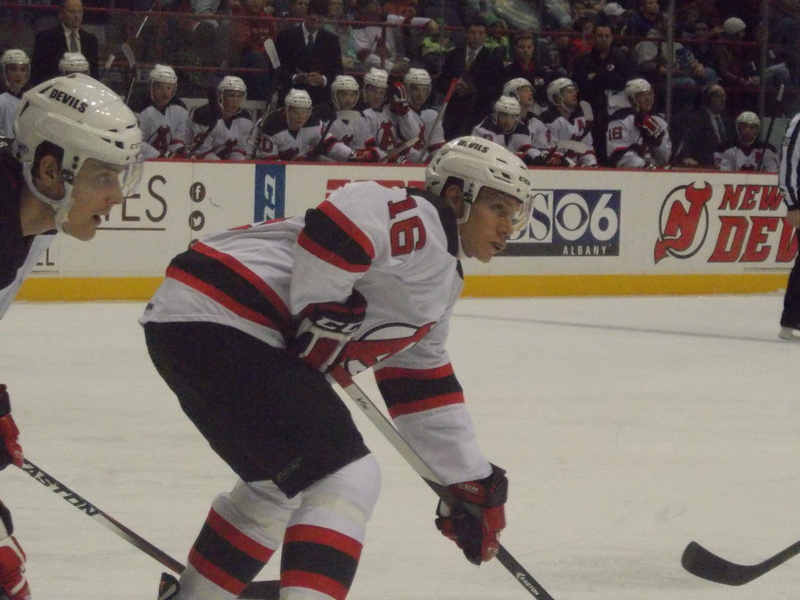 But second period was all Devils, as they broke out for four goals. Brandon Burlon scored his first of the season four minutes in to break the tie. Raman Hrabarenka would add his fourth just over 90 seconds later for a 3-1 lead. Just over two minutes later, the new guy, Eric Baier, would get into the act by scoring his first AHL goal since the 2012-13 season (playing for Charlotte) to make it 4-1. Finally, Ben Johnson would score his first as a professional in a shorthanded situation late in the period for a 5-1 advantage. 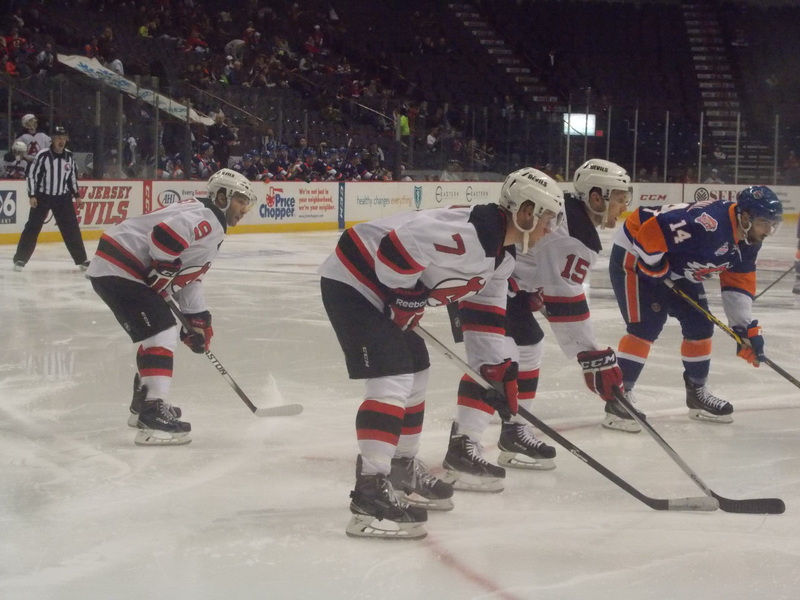 The Sound Tigers tried to make a comeback in the third, outshooting the Devils 14-7 and getting their second goal, but Keith Kinkaid and the depleted defense took care of the rest, breaking a 3 game losing streak and finishing the first 3 in 3 weekend on a high note. Kinkaid rebounded nicely from a disastrous Friday start and stopped 26 of 28 shots, earning #1 star honors. 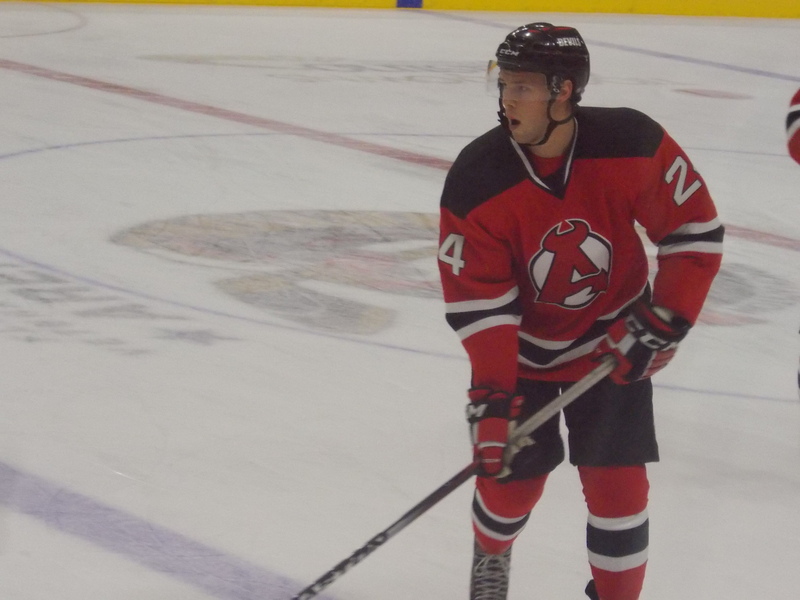 Five other Devils added assists, including the first professional point for Joe Faust. Pop Quiz: The 7-0 loss in Binghamton was the most lopsided loss in the history of the franchise, going back to the Lowell years. But it’s not the worst in the overall Albany AHL history. What is the largest margin of defeat for an Albany AHL team? The answer coming up. No video from Friday’s festivities has surfaced. Oh well. For managing to pull off multi point weeks despite the struggles of the weekend, Joe Whitney and Paul Thompson split the award. 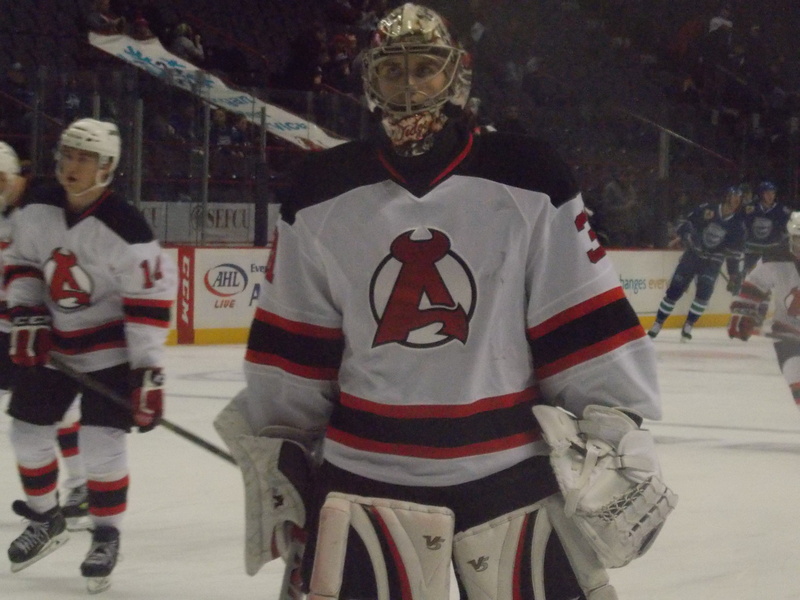 Maxime Clermont (Orlando): 7 GP, 5-2-0, 3.56 GAA, .884 Save Pct. A home laden schedule, but with an exception. Wednesday Hartford comes to visit for the second time in a month. Black Friday will be spent in the other home, Atlantic City’s Boardwalk Hall, as the Devils face Lehigh Valley for the first time. Finally on Saturday afternoon, the only appearance of the season by Utica. Pop Quiz Answer: The most lopsided loss in Albany AHL history? You have to go back to March 22, 1996. The River Rats dropped a 10-1 decision to the old Carolina Monarchs in Greensboro, NC. Bonus: the most lopsided shutout loss was back on March 25, 2001, when the Rats lost to Quebec 8-0. -Albany begins the week at 7-4-1-3, good for 18 points and a third place tie with Hartford in the Northeast Division (and 6th in the Eastern Conference). 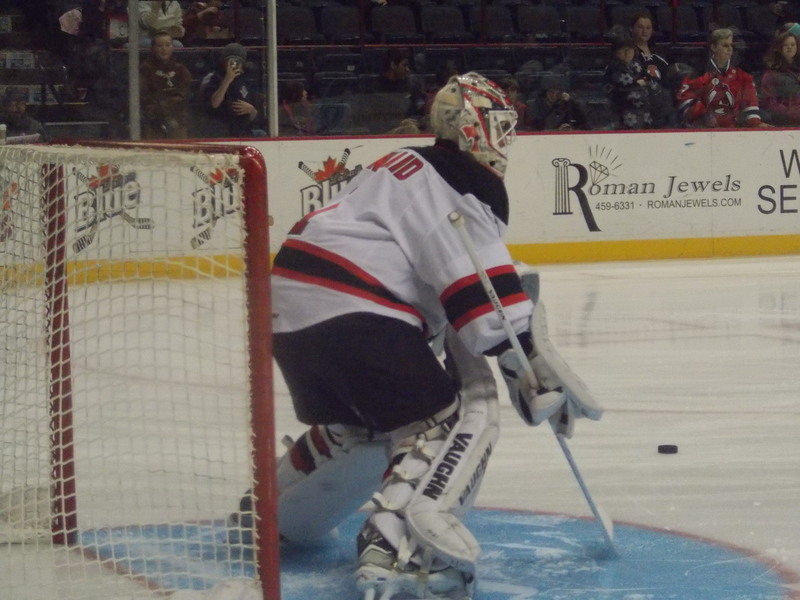 On Monday, a switch in goal, as Scott Clemmensen was recalled to New Jersey and Keith Kinkaid was sent down. 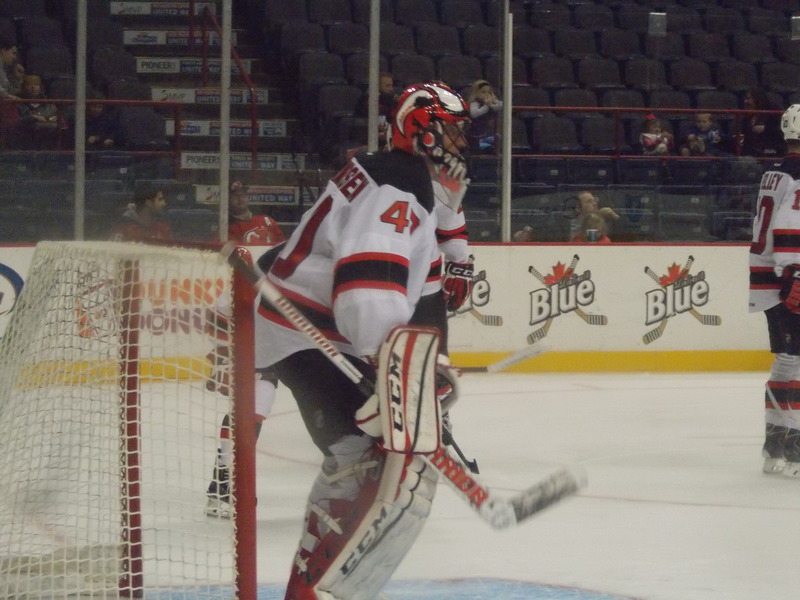 Clemmensen played well in his near 2 week stint, going 1-2-1 with a 2.18 GAA and one shutout. 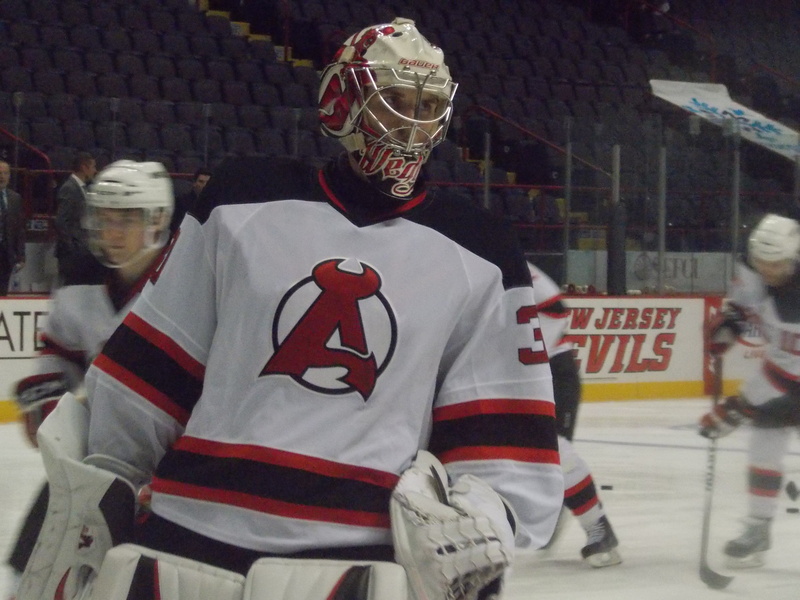 Kinkaid made two relief appearances during his recall, going 0-1-0 with a 2.22 GAA. 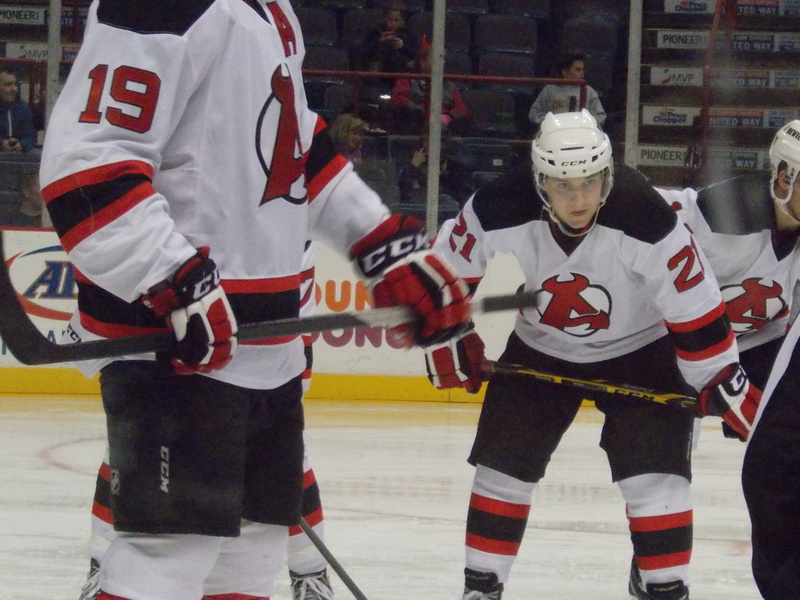 Also, defenseman Peter Harrold was recalled for insurance during New Jersey’s western Canada trip. Tuesday the AHL announced a pair of suspensions stemming from Saturday night’s loss in Portland. Mark Fraser was handed a 3 game sentence for a check to the head call, while Paul Thompson received two games for a goalie interference incident after running full speed into Pirates goaltender Louis Domingue during the second period. Both will serve their sentences this weekend, with Thompson returning on Sunday. -The Penguins rebounded from a 1-2 weekend to pick up a shutout win at home Wednesday night against Portland. 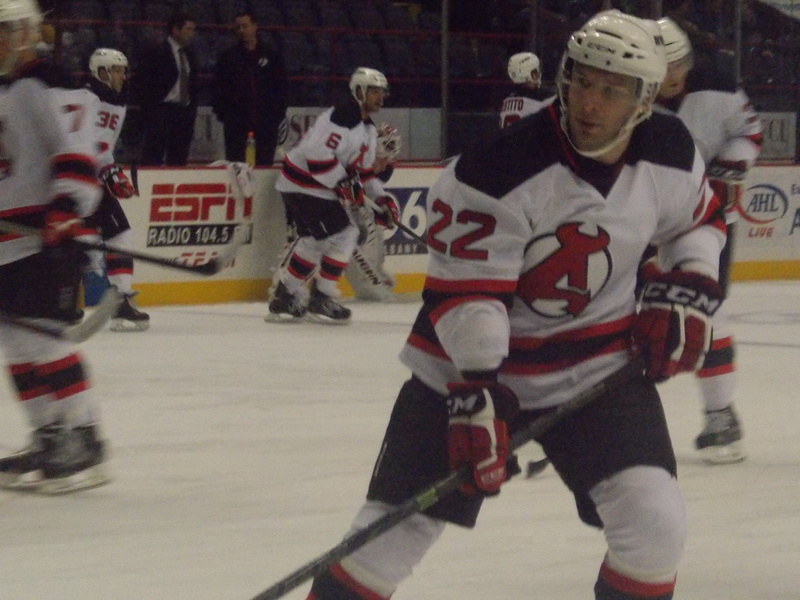 -Two of the top 5 PIM leaders in the league are Penguins: former Devil/River Rat Pierre-Luc Leblond and Bobby Farnham, who played a role in Darcy Zajac’s suspension the last time the two teams met. -It’s the annual Word of Life night at the TU Center. You’ve been warned, everyone. But in all seriousness, this will mark the first home game with the chance for a substantial crowd, which may be a factor. -The Senators are coming off a weekend split in Norfolk, winning 5-2 on the 14th and losing 3-2 on Saturday. They will host Manchester on Friday night. -Leading scorer Chris Wideman was named the AHL Player of the Month for October after an 11 point (6 G, 5 A) in 9 game stretch. 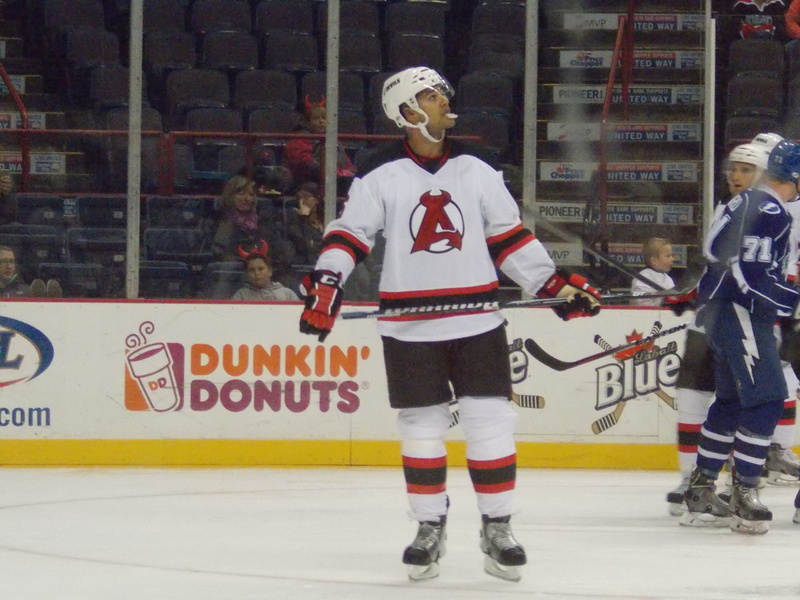 -Local ties: Former A-Devil Brad Mills is listed on the roster, but has yet to make an appearance due to injury and a 20 game suspension issued in late October for violating the AHL’s substance abuse policy. Season Series: Bridgeport leads 4-1. -The Sound Tigers are coming off a 2-1 weekend, sweeping Hartford in a home and home before losing to Springfield on home ice Sunday afternoon. They travel to Springfield Friday and Hartford on Saturday. 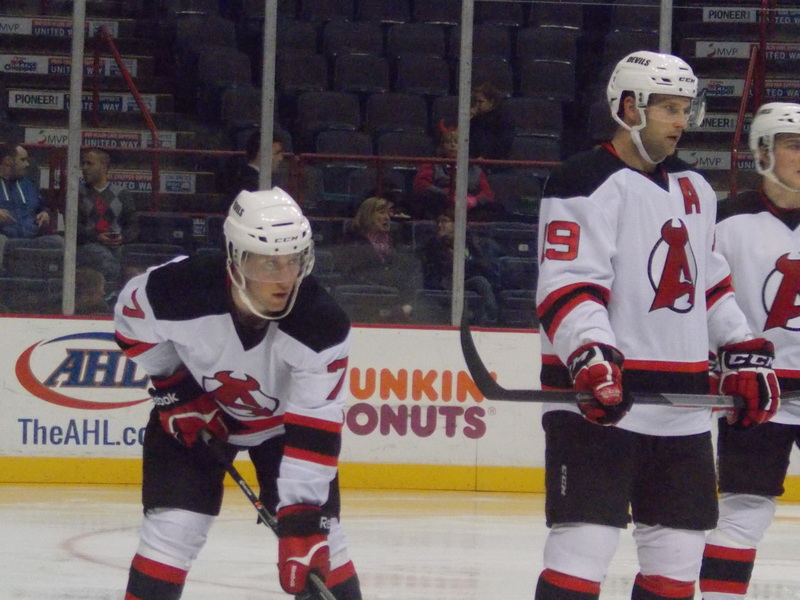 -Bridgeport leads the AHL in goals per game with an even 4.00. They also lead the league in first period goals (21) and are tied with Worcester for first in third period goals (22).